One more point could provide a big lift for the Dallas Stars. Dallas' playoff road remains muddled after it lost 6-1 to Chicago on Friday night. 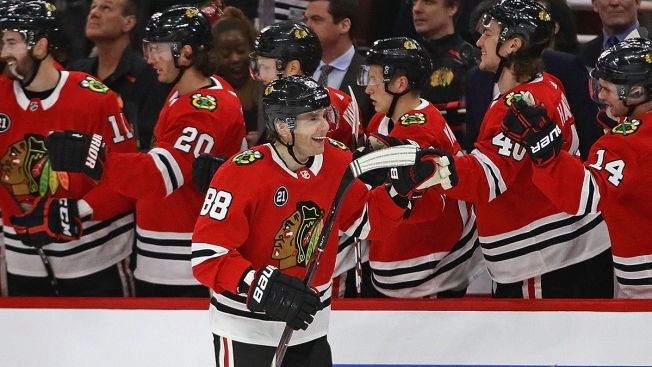 Patrick Kane scored twice in the Blackhawks' home finale, and Cam Ward made 25 saves in his 700th NHL game. The Stars (42-32-7) clinched their first postseason trip in three years with Tuesday night's 6-2 victory over Philadelphia, but they need one more point to secure the Western Conference's top wild card. "We'd like to stay in our own division because it's less travel," Dallas coach Jim Montgomery said. "So it's important tomorrow that we come out and play a lot better than we did tonight." "This was a nice way to finish the season here," Kane said. Valeri Nichushkin was sick, and Montgomery said it was a coach's decision to scratch Andrew Cogliano. "We'll get over this pretty quick," forward Tyler Seguin said. "I think everyone was kind of focused on next week maybe tonight." It was Kunitz's fifth goal in his 15th NHL season. The four-time Stanley Cup winner could retire when the season is over. "The second half of the year, I'm thought maybe this is the last one," he said. "You never know. Being healthy scratched, not knowing if you can get back in there, not knowing where the season is turning. I was fortunate enough to get back in there, play some competitive games, play a little more like I remember myself is playing. I tried to leave it all out there." After L'Esperance got Dallas on the board at 7:18, Kane got his 44th goal when he beat Khudobin on a breakaway with 3:49 to go. Kane has three goals and four assists in his past five games and needs two goals in Saturday night's finale to match his career high of 46 from the 2015-16 season.